Alpha Nursery & Garden Center is our sister company that provides all of the materials that we install in your yard. Please feel free to browse the nursery site. Alpha Nursery is located on Highway 55 at Mile Marker 108 on the corner of Alpha Lane, about 6 miles south of Cascade, ID. 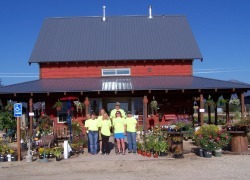 We are a full service nursery dedicated to the residents of Valley County, ID. Browse through all of the plants and products that we offer. Experience our excellent customer service when you come to visit us.